Originally posted on our Think Before You Pink blog. 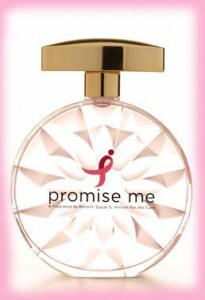 Susan G. Komen for the Cure has partnered with TPR Holdings, LLC, a New York City-based investor and operator in the consumer products industry, to create a perfume called Promise Me. According to the fragrance’s website, the pink-tinted Promise Me is “The Scent of Inspiration.” Its neatly packaged bottles and gift sets, with the all-too-familiar Komen ribbon emblazoned on the side, remind us that it’s not just inspiration Komen and TPR Holdings wants – they want us to shop our way to a cure. Breast Cancer Action, like many of our favorite bloggers, disputes the real value of this type of cause marketing for several reasons. The amount of each perfume purchase dedicated to supporting breast cancer research is paltry (Katie Ford Hall at Uneasy Pink notes that only $1.51 of each bottle will go to research, despite the whopping $59.00 individuals will spend per 3.4 oz bottle of Promise Me Eau de Parfum). Two of the fragrance’s ingredients are potentially carcinogenic. I visited the Home Shopping Network’s webpage dedicated to Promise Me Eau de Parfum and did some sleuthing. The ingredient coumarin rated a 6 (or moderate hazard) on the Environmental Working Group’s Skin Deep Cosmetics Database hazard scale. Coumarin is a naturally occurring and synthetically produced scent chemical, about which the Carcinogenic Potency Project at UC Berkeley determined there is limited evidence of carcinogenic activity in rats and mice. In addition, I found that Ci 60730 (also known as Violet 2) ranked a 3 (or moderate hazard) on the Skin Deep hazard scale. Like coumarin, there is limited evidence of cancer connected with Violet 2. What’s that, you say? It seems hypocritical that Susan G. Komen for a Cure would create a perfume that contains potential carcinogens while simultaneously claiming to fight “every minute of every day to finish what we started and achieve our vision of a world without breast cancer”? That’s what Breast Cancer Action thinks, too. No amount of shopping for pink ribbon products will rid our world of the breast cancer epidemic. We need to change the conversation about breast cancer – to one that focuses on eliminating toxins from the personal care products that we use daily, and where we boldly call out pinkwashers for distracting us from the real work that needs to be done. 3 Responses to Promise me you’ll read the ingredients on this pink perfume!